Each Modern is pleased to announce a solo exhibition by Japanese photographer Nakahira Takuma; a special project in the Hong Kong International Photography Festival. Nakahira(1938 – 2015), the most celebrated photographer to emerge from the Japanese Provoke movement, rethought and reinvented the meaning of photographs. The exhibition is comprised of a special projection of For the Language to Come, prints of Circulation: Date, Place, Events, a premiere remake of photographic installation Overflow, and a selection of later period untitled color works. As the statement in Provoke Vol.1 : “Provocative Materials for Thought”, the images from For the Language to Come not only demonstrate the visual impaction in urgent, blurred and grainy style, but also the desire to convey city landscape and political protest, from anti-war demonstrations and student protests to the effects of globalization and urban deprivation. 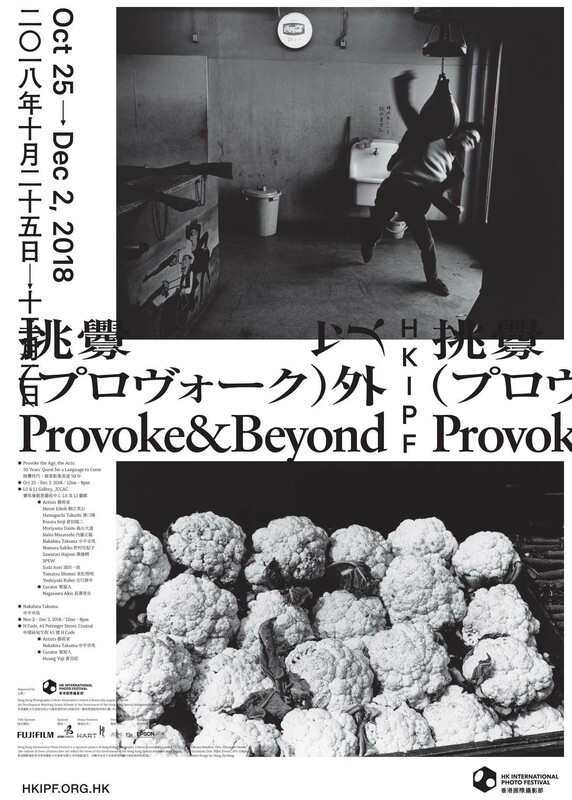 In the exhibition, images from the legendary photobook will be projected covering all the spaces to abolish our common perception of viewing photographs, as well as to return to Nakahira’s primeval provocation of challenging academic exhibition. After 1970, Nakahira underwent a decisive change to refine his practice of photography. Circulation: Date, Place, Events for the 1971 Paris Biennale was an example transforming photography into performance and dismantled the subjected consciousness. The image themselves address a cryptic reality since the message it conveys is often relayed through traces of meaningless. In the same time, Nakahira began to work on color photographs and released them mainly in Asahi Journal. Continuing his political language but unveiling cityscapes with fragmented scopes, Nakahira experimented with his concept “illustrated dictionary” later described in his famous criticism Why an Illustrated Botanical Dictionary? In 1974, he selected 48 images to create his only photographic installation Overflow for an exhibition at the National Museum of Modern Art, Tokyo. The work is in the collection of the museum. In 1977, Nakahira was tragically stricken with memory loss and aphasia. He returned to shooting the following year with the images he saw everyday on the street: fire, water, birds, animals, trees, flowers, cats and street people. The selected color works presented here were made later in his career, around 2000. The colored objective images are the ultimate presentation of his struggle to pursue the provocative questions disclosed in his writings and photography: the essence of photography is only an equivalent record. On 3/F, the majestic projection installation of For the Language to Come interchanges the space and images. The higher level features the prints of Circulation: Date, Place, Events and selected untitled later period color works. Adjacent to photographic installations is Overflow, remade and exhibited for the first time in Asia. Nakahira’s work has been the subject of many museum exhibitions around the world, including ”Nakahira Takuma: Degree Zero – Yokohama” (Solo. Yokohama Museum of Art, 2013), “Roppongi Crossing 2013: Out of Doubt” (Mori Museum, Tokyo, 2013), “Things: Rethinking Japanese Photography and Art in 1970s” (The National Museum of Modern Art Tokyo, 2015), “For a New World to Come: Experiments in Japanese Art and Photography, 1968–1979” (The Museum of Fine Arts, Houston and touring, 2015), “Japanese Photography from Postwar to Now” (SFMoMA, 2015), “Provoke: Photography in Japan between Protest and Performance, 1960–75” (Albertina, Fotomuseum Winterthur, Le Bal and The Art Institute of Chicago, 2016-2017) and “Nakahira Takuma：Circulation” (Solo, The Art Institute of Chicago, 2017).